Interested candidate please send in resume to elvina@imsjobs.com. Thank you! "Multimedia background and related to General IT & Engineer IT"
Happy Weekend Job Seeker! Our clients are looking for a Malaysian Talented to join their company. Below are the positions for you to apply; Position : Specification Seller Salary : up to RM6,000 Location : Kapar, Klang (next to Setia Alam) Position : Sales Executive Location : Vietnam Salary : up to RM3,000 Requirements : Chinese (non halal environment), fresh graduate Position : RD&I Chemist Location : Muar, Johor Salary : up to RM4,000 Requirements : experience in related field. Position : Command Centre Location : PJ Salary : up to RM5,000 Requirements : have experience in Customer service, willing to work on shift Position : Receptionist Location : KL Salary : up to RM2,500 Requirements : Chinese, fresh graduate Position : Marketing Executive (Digital) Location : Balakong, Seri Kembangan Salary : up to RM4,000 Requirements : Lady (due to environment), Chinese and have experience in Digital Marketing If you are interested to join, kindly send your latest cv to siti@gloryhrsolutions.com @ WhatsApp 018-3794988. Appreciate you can spread it around. Thanks and have a nice day! Hi guys, I would like to share our latest job vacancy as per below details. And do take note that this positions open for Malaysian only. Minimum of Ten (10) years of experience in cementing, tool and pressure testing operations and services. Qualified, trained and certified to mix and pump cement (including special blended cements) as per COMPANY's requirements. Minimum of 3 years of experience in Cementing Equipment Operation . Familiar in Preventive Maintenance System (PMS). Minimum of 1 year of working experience in cementing operation. We are now searching for dynamic, self-motivated and result oriented candidates to fill the following positions. Supervision of project construction activities and respective subcontractor activities. Greetings from Ideal Reliance. We are currently looking for someone to work in a multinational oil & gas company as a Contract Administrator. •Minimum degree in any field of study (CGPA 3.0 and above). •Language requirements: Cantonese & English (written & spoken). •Intermediate knowledge in Ms Excel & Ms Word required. •Prior experience in Contract Management a plus point. Interested? Kindly send over your updated resume to n.amira-ismail@idealreliance.com. Only shortlisted candidates will be notified. Thanks! 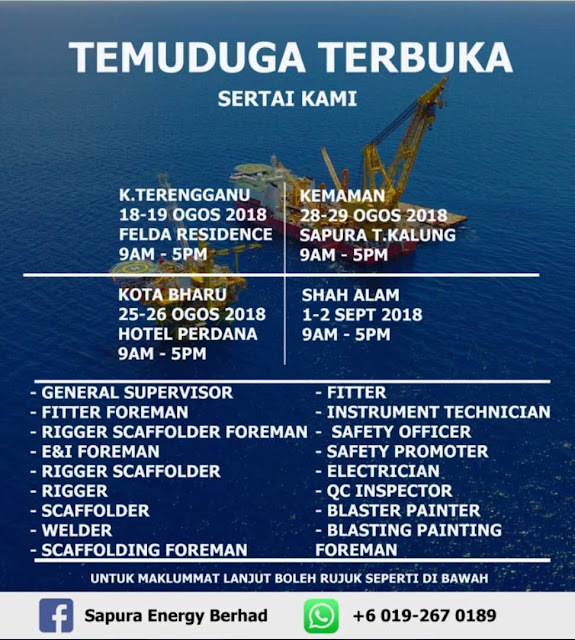 Kindly send your resume to hafiz.azizan@kemuncaklanai.com with position title as subject. Please take note that only shortlisted application will be contacted. Position will be offered on contract employment. Urgent Vacancy : Relationship Manager, Banking (few openings). Position level - Executive up to Senior Manager. Export-Import Bank Of Malaysia Bhd is currently looking for a talented & passionate individual to take up the position of Relationship Manager, Banking Department. Requirements : Malaysian only, Degree in Banking / Accountancy / equivalent, min 2 years experience in credit analysis / assessment of corporate loans, conversant in banking & insurance products (both conventional & Islamic), excellent communication & writing skills. If you are a talented individual who aspire to be part of our dynamic organisation, please email your CV to recruitment@exim.com.my asap for our consideration (only shortlisted candidates will be notified). Based in Damansara Utama, PJ (near 1 Utama and PJ Uptown) ● SPM/STPM/fresh graduate ● 5 working days ● Salary RM1400-RM2000 (Depend experience) ● PC literate & teamwork ● Fast Increment, Insurance, Prayer Room, Company Trip, Carpark allowance, Incentives, Medical ● Email CV to job@nbc.com.my. • Candidate must possess at least a Degree in Human Resources Management, Business Administration, Public Relations or equivalent. • Knowledgeable and experience in handling application and administration of expatriate/foreign workers and immigration procedures. • Good rapport with local foreign worker agencies and related government agencies. • Proficient in both spoken and written in Bahasa Malaysia and English. • Good communication and interpersonal skill with strong leadership. • Able to work under pressure and multi task. We are looking to hire merchandiser @ buyer for non-food category with at least 3 years of experience as buyer or managing key account before. Those who keen, pls message me directly or send in your latest resume to ellyna.tajuddin@7eleven.com.my. **Location: Jalan Tun Razak, KL / Serdang Jaya, Selangor. **Requirements: Posses related experiences in infra-work/tunneling/construction projects. We are looking for experienced candidates with background of Accounts (AP, AP, GL), Finance (Treasury), IT (Software, Web Digital Marketer, Call Centre Specialist, Networking), Administration and Marketing. • Candidate must possess at least a Diploma/Advance/Higher/Graduate Diploma, Bachelor's Degree from Business Studies/Accountancy/IT/Marketing/ or equivalent. • Minimum 1 year experienced candidates are encouraged to apply. • Good command of English and Bahasa Malaysia. Able to speak in Chinese will be an added advantage. • Applicants willing to travel and possess own transport. Please note that all the above vacancies are open to Malaysian only. - Able to read, speak and write in Mandarin, Malay and English. - Must has own transportation. - Able to travel outstation and oversea. - Willing to learn and good attitude. Interested candidate can send your profile to max.lee@recruitexpress.com.my for more inquiries. But first, click on our official website (www.azrb.com) for more info about our Company. Hi! Any QAQC Engineer / QC Inspector here? We need youuuuu guys for our Building, Highway and MRT projects! *Only shorlisted cdd will be notified. Thank you for those who've sent me your CV for the previous job posting. Thank you so much! Currently sourcing for Trade Sales positions for Business Banking Division at Bank Muamalat. Vacancy : Relationship Manager, Banking. If you are a talented individual who aspire to be part of our dynamic organisation, please email your CV to recruitment@exim.com.my not later than 31 January 2018 for our consideration (only shortlisted candidates will be notified). Good morning friends and fellow connections. If you happen to fit the requirements and wish to apply, or happen to know someone who might be interested or applicable for this role, comment here, contact me at 012-7029304 or drop a CV at chunkeat@pplefirst.com. You can view the full JD @ jobstreet portal OR you can drop me an email izzati@prestariang.com.my for any inquiries. Get in touch if you would like to be part of our e-logistics revolution! We are hiring for below positions in Penang. #Specialize in SAP BASIS/Netweaver and Database administration with more than 10 years’ experience. #Minimum of 7 years relevant experience in System Administration/Management with SAP Systems. #Experienced in SAP modules, includes ERP, BW, BPC, BSC and also has worked in Oil and Gas industry. 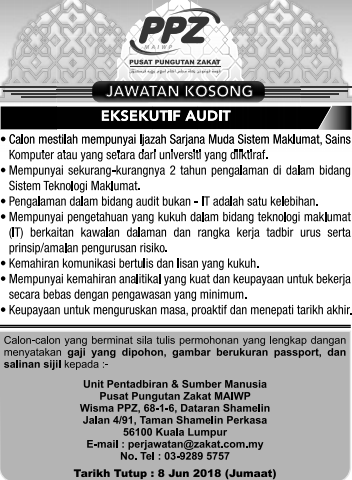 - Diploma/Bachelor Degree in accounting/finance. - Account Executive (AP or AR) with 2 to 3 years of experience to be based in Bangsar South. - Account Executive with 2 to 3 years of experience and Senior Finance Executive with 4 to 5 years of experienceto be based in Cyberjaya. - Senior Accountant, equivalent to Assistant Finance Manager level professionally qualified (with over 10 years of experience) to be based in KL city. * Only shortlisted candidate will be contacted for further discussion. I am currently looking for candidates for various Assurance (Risk, Compliance & Internal Audit) roles within the organization. Interested, please submit your resume to firdaus-hilmi@ambankgroup.com or email / PM me for details. Urgently require Contract Manager/Senior Manager with experience in handling pre/post contract management for EPCIC project/s. Based in Pasir Gudang, Johor. Do you know that our Premier Centre is expanding? Now you know!